…And it appears that the 2018 winter months are going to feature colder and wetter-than-average conditions in many parts of the northern tier U.S. and eastern Canada. A key indicator is that weak La Niña conditions have already officially developed, and the forecast is for a 65 to 75 percent chance that they will persist through the 2018 winter months. January through February temperature outlooks from both The Weather Company and NOAA feature some similarities to what is typically expected in a La Niña winter. They suggest the greatest risk of cold early in the winter in eastern Canada, with the cold retreating towards the Pacific Northwest as the winter progresses. So before more wintry temperatures get their grip, these dozen reminders of cold weather safeguards are worth noting. Turn off sprinkler systems and blow compressed air through the lines to drain them. Don’t forget to check on pipes to your washing machine in the laundry room. One more Paul Davis winter suggestion. 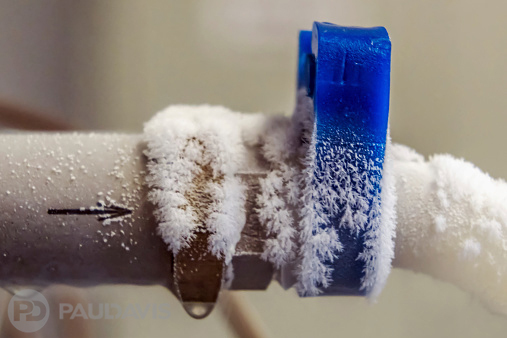 After the weather has warmed above freezing and any frozen pipes have thawed, turn off dripping faucets and monitor your water meter to check for unseen leaks. Protecting homes and businesses from pesky winter pipe bursts takes just a little time, but can easily eliminate a host of winter and spring problems.